When peaches are in season, this recipe for peach jelly is one you’ll want to keep nearby! We make this peach jelly from peelings to avoid waste. This peach jelly is a great way to use up all the “scraps” of the peaches, and it’s so delicious! My kids will eat through a jar of peach jelly a day, if I let them. It makes a great gift as well. We like to use the early season peaches, RedHaven, for this peach jelly. However, you can use whatever peaches you have. It will work the same with any variety. There are two types of peaches, cling and freestone. Cling peaches refer to the type of peaches that have the flesh “cling” to the seed. Freestone peaches are easier to can and use, as the stone (seed) is more easily removed from the flesh. Consider using the freestone varieties RedHaven, Early Loring, Redkist or Scarlet Prince for great flavor and ease of canning. Cling peaches CAN be canned, but removing the stone from the flesh will just take a bit more effort. Once you get your peaches, carefully wash them off. As you are canning your peaches, and removing the skins and other parts you don’t want to can (brown spots or soft spots) save them into a large pot. When you are done with the peaches, fill the pot with the scraps with water to cover. Bring to a boil for 30 minutes, and then let sit covered, overnight. The next day, strain the peachy water through a cheesecloth or jelly bag. Don’t squeeze the cheesecloth, as this can make your jelly cloudy. This is now your peach water. If you want to make peach syrup, add 3 cups of sugar for every 3 cups of peach water and heat until the sugar is dissolved. This is great for flavoring tea and kombucha. Take 3 cups of your peach water and add 1 box of pectin. Bring to a rolling boil, then add 3 cups of sugar. Bring back to a boil and set the timer for 1 minute, stirring constantly. Spoon the foam off the top, and ladle the peach jelly into hot pint jars. Process in a rolling boil water bath for 20 minutes, beginning when the water returns to a full boil. Remove and let cool for 12 hours. After 12 hours, check the seals and store any that didn’t seal in the fridge and use within 3 weeks. For those that sealed, remove the bands, wipe the jars with warm soapy water to remove residue and store up to a year. 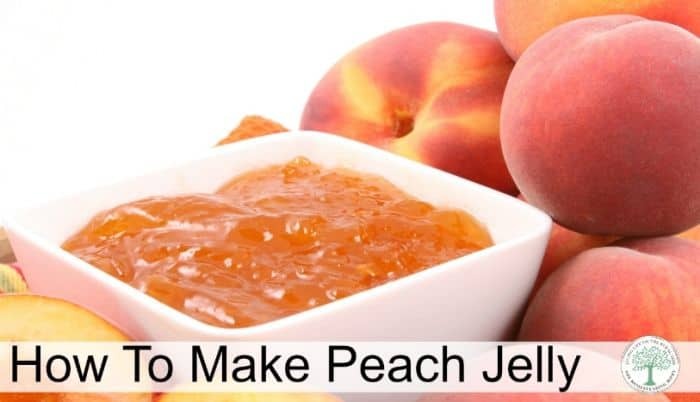 Have you made peach jelly? Would you like to try some this year? Be sure to pin this for later! it will vary depending on how many peels you use and how much water you use. How many peaches do you use?